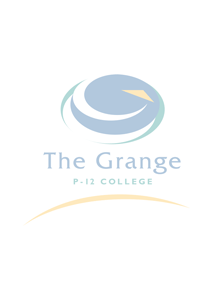 Children are required to wear The Grange P-12 College school uniform, including black leather shoes. Please note a sport uniform is also required for students in Years 5 to 12 who undertake PE, sports electives or participate in inter-school sports. The College dress can be worn throughout the entire year and black and/or navy tights are permitted. Students are to wear black leather school shoes. Students may change into runners for Physical Education classes and sport. Hats are compulsory in Terms 1 and 4 for students in Prep to Year 6 and children must have them on whenever they are outside. Hats are available from the Uniform shop. Children who do not wear a hat at recess and lunch are required to sit under the covered area. NO HAT- NO PLAY!